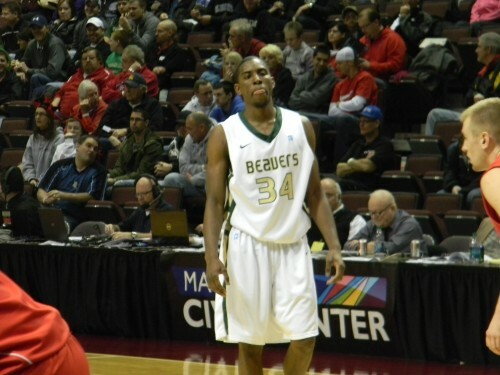 James Ellisor once again led the Beavers in scoring with 14 points Wednesday en route to a 57-53 victory. Photo by Patrick Rudlang. 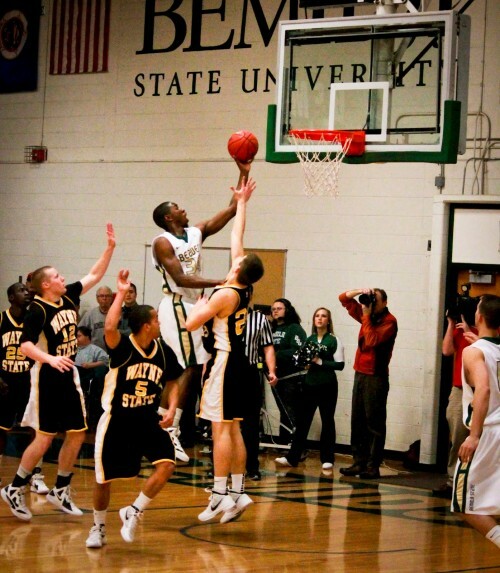 Senior guard Bryce Tesdahl lifted the Bemidji State men’s basketball team over Wayne State in the first round of the NSIC conference tournament in the team’s 57-53 victory. Down by one point with 30 seconds left to play, senior guard Bryce Tesdahl caught the ball at the top of the three-point arc and released what would be his last shot at the BSU Gym. As the shot sunk through the bottom of the net the season-high crowd of 2,279 exploded into cheer. A layup from senior forward James Ellisor gave the Beavers an early 6-2 lead. With just under ten minutes left in the first half, BSU became the first to strike double digits thanks to jumpers from guards Jake Schalow and Dermaine Crockrell that increased the lead to 12-4. Crockrell finished with a dozen points with a pair of three-pointers. Ellisor just got two shots on two attempts in the first half. Six minutes later, the Wildcats would finally hit double digits after a three-pointer from Ryan Rolfzen to make the score 16-11 with 3:21 remaining in the half. Both team’s shot under 50 percent in the first half — BSU at 43 percent and WSC at 25 percent — and the Beavers led 21-15 at the break. After a free throw from junior forward Mason Walters, Ellisor pulled down the rebound on the miss that followed and finished with a layup to give BSU a 29-21 lead with 15:25 left to play. Back-to-back baskets from junior guard Lance Rongstad gave the Beavers its largest lead since the first half at 33-23 with 13:04 remaining. Rongstad finished the game with a dozen points on 5-8 shooting and a game-high nine rebounds. The Wildcats would answer quickly to cut the lead back down to four following a three-pointer from Ayron Worthington with 11:26 left in the game. WSC finished the game knocking down six three-pointers on 14 tries. With just under six minutes left to play the Beavers got baskets inside from Walters and Rongstad to extend the lead to 47-39. Wayne State answered with a 12-3 run to take its first lead since 2-0 at 51-50 with 59 seconds left to play. Tesdahl answered by calmly knocking down the long distance jumper to re-take the lead at 53-51.He would then pull down the rebound on Vontrell Seroyer’s miss and throw an outlet pass to a streaking Ellisor who finished with a flush on the other end to seal the victory. Ellisor — who entered the game as the leading scorer in the conference and third in the country with 22.5 points per game — finished with a team-high 14 points on 5-9 shooting. With the win, the Beavers finished the season with an impressive mark of 13-2 at home. Bemidji State (22-7 16-6 NSIC) advances to the NSIC tournament semifinal to play MSU-Moorhead at 2:30 on Saturday in Rochester. With a win, BSU would play the winner of Southwest Minnesota State and Winona State for the conference tournament championship 4:30 on Sunday.